I usually keep my scares as neatly folded as possible because I don’t like them to be all wrinkly when I wear them. 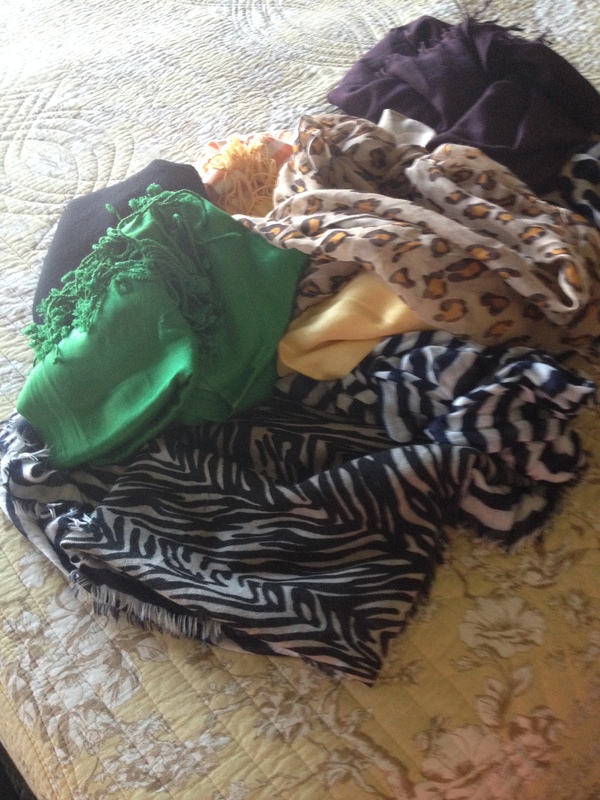 But my collection is growing (again–after purging the ones I wore as a restaurant hostess circa 1991). And they keep sliding off their shelf. How about this? I like it because it reminds me of the way they display them in stores. But — two issues — they take up a lot of precious hanging space, and they will be wrinkled where they’re “tied” onto the rod. Hmmm. . . back to the drawing board. Anyone got the perfect solution? A forgotten household task . . . I don’t keep a “to be ironed pile” like my mother did. In fact, I rarely iron anymore. I grab things out of the dryer or sometimes even the washer and hang them up in hopes of avoiding wrinkles. 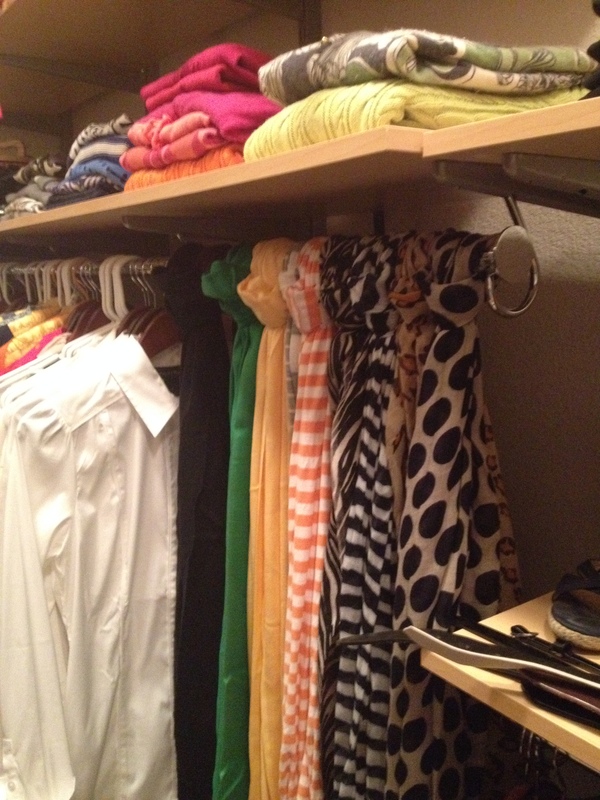 Then I pull out the ironing board to touch things up right before I wear them. And on busy mornings you go for something that doesn’t need ironing, right? Since starting my burlap obsession, I’ve had the ironing board up and given it a workout. Finally perfected the pennant technique to include ironing Wonder Under between two pieces for sturdiness and to avoid fraying edges. Then I iron the top down into a half-inch fold, giving a nicer place to glue the twine than across the front of the pennant. All of this “fun with burlap” has left my ironing board and my iron a mess. My Dear One, who actually likes ironing, is the one who purchased both of these. He’s pretty meticulous about his clothes and loves that Rowenta Professional iron (even bought his mother one!). Thought I’d press a few things for my girls and myself this rainy Saturday morning but have to Google “how to clean an iron” first. And then consider going to Target for a second ironing board cover; maybe I can switch them out for clothes vs. burlap?